Video from a helicopter shows the scene after a Tesla vehicle and a semi-truck trailer collided. A federal safety agency is sending a three-member team to investigate a fatal crash involving a Tesla electric car and a semitrailer that is strikingly similar to a 2016 crash involving another vehicle made by the company. The National Transportation Safety Board said late Friday on Twitter that the team would work in cooperation with the Palm Beach County Sheriff's Office, which is probing the Friday morning crash in Delray Beach. A sheriff's report says the tractor-trailer was making a left turn onto a divided highway to head north when the southbound 2018 Tesla Model 3 hit the semi's driver side, tearing off the Tesla's roof as it passed under the trailer. 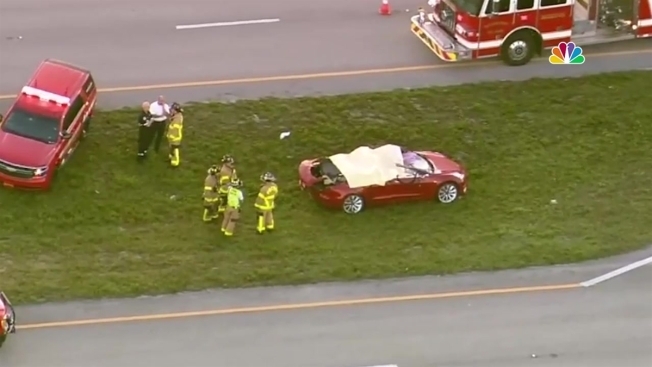 The Tesla's driver, 50-year-old Jeremy Beren Banner, died at the scene. The report didn't say whether the Tesla's Autopilot semi-autonomous driving system or its automatic emergency braking system were working at the time of the crash. Tesla released a statement Friday expressing sadness and saying the company is "working to learn more and are reaching out to the authorities to offer our cooperation." Tesla has said that Autopilot and automatic emergency braking are driver-assist systems, and that drivers are told in the owner's manual that they must continuously monitor the road and be ready to take control if necessary. In January of 2017, NHTSA ended an investigation into the Gainesville-area crash, finding that Tesla's Autopilot system had no safety defects at the time. But the agency warned automakers and drivers not to treat the semi-autonomous driving systems as if they could drive themselves. Semi-autonomous systems vary in capabilities, and Tesla's system can keep a car centered in its lane and away from other vehicles. It can also change lanes when activated by the driver. Tesla CEO Elon Musk announced Tuesday that his company is laying off around 4,000 employees as it seeks to turn a profit in the second half of the year.